Liam's Gang » Blog Archive » Time for a Party! Life has been a little crazy as of late. We have been bouncing back and forth to New York every few weeks for treatment, not to mention Baby Kelly is due to make an appearance any time now. 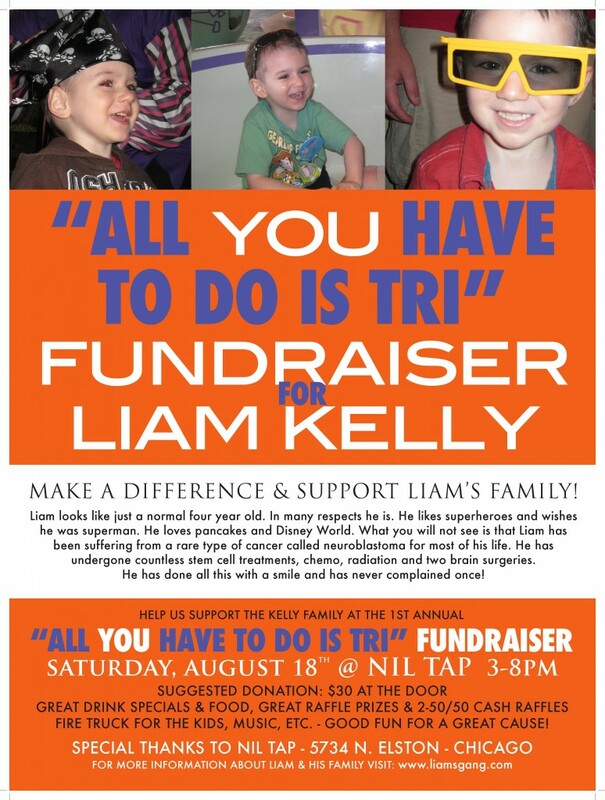 We have not had a lot of time to stop and update everyone via the website, so if you are around this Saturday come out and meet us at the Nil Tap for a fun block party to support Liam. What: All You Have to do is Tri Fundraiser! For those of you who have not heard, our friend Mike Schaefer heard what happened to Liam while we were in Hawaii and all the treatment Liam has had to start up again and said to himself that he needed to do something. Mike was already planning on doing the Chicago triathlon so he thought about having some folks sponsor him. It was then that his mother stepped in and said “Mike your thinking to small. Let’s do this right” it was then that they came up with the idea to have the block party…and the rest is history. It should be a great day. Mike is having a couple of the Shannon Rovers come, a firetruck for the kids (or adults), a DJ, food and great raffle prizes!!! We cannot wait to see everyone, so come on over if you are in town and looking for a fun way to spend Saturday! Thanks for throwing this party Mike, it will be great to see everyone!